HOUSTON (KTRK) -- The No. 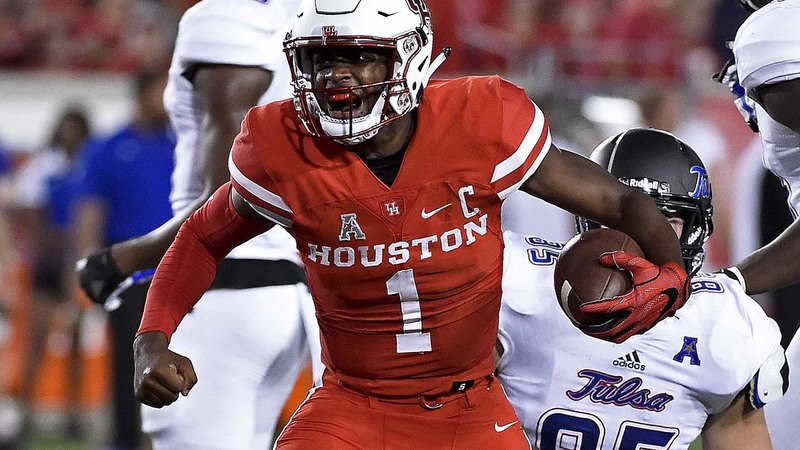 13-ranked Houston Cougars survived a game that literally came down to inches Saturday night against Tulsa. With just 1:21 left in regulation and the score tied at 31, Cougars' Emeke Egbule picked up a Tulsa fumble and returned it 24 yards for a touchdown. The game was tied at 31-31 when Garrett Davis knocked the ball out of the hands of quarterback Dane Evans. Egbule scooped it up and dashed into the end zone for the score. Tulsa (4-2, 1-1 American) had a chance to tie it, but Jesse Brubaker was stopped just short of the goal line after a reception on the last play of the game to seal Houston's victory. The play was reviewed and upheld. It was a close call for the Cougars (6-1, 3-1) a week after Navy beat them 46-40 for their first loss of the season after a 5-0 start. "We got the taste out of our mouth," Houston coach Tom Herman said. Tulsa never led, but had twice rallied from 14-point deficits to tie the game. The second time came when James Flanders scored on a 3-yard run with 3:31 left. The Golden Hurricane forced a punt after that, but the fumble by Evans came two plays later. Houston's Dillon Birden ran for 82 yards and three touchdowns playing in place of injured starter Duke Catalon. Quarterback Greg Ward Jr. led UH with 254 yards passing and one interception. Ward Jr. also notched 142 yards rushing on 25 carries. The Cougars will take on SMU next Saturday in Dallas.